The Salvation Army’s National Editor-in-Chief, Lieutenant-Colonel Laurie Robertson (centre), with editorial staff representing various Australian and New Zealand Army publications at the Australasian Religious Press Association Awards for Excellence in Brisbane at the weekend. 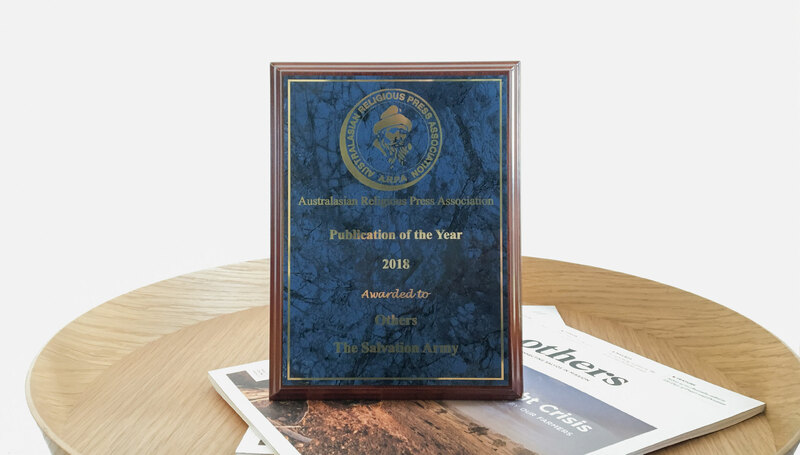 Others magazine received the Neumann & Turnour Lawyers "Publication of the Year 2018" award at the Australasian Religious Press Association (ARPA) Awards for Excellence in Brisbane on Saturday. Others magazine won the Neumann & Turnour Lawyers Publication of the Year award for 2018. More than 80 publications across Australasia are current members of ARPA. Others magazine also received the silver award for Best Website (others.org.au), silver award for Best Design Magazine, and the bronze ward for the Best Social Justice article – Vaughan Olliffe’s “Longing to Belong” on the equality of people with disabilities. “The awards are fitting recognition for our hard-working team who continually produce a quality magazine and online news service,” said Others Managing Editor Scott Simpson. Cheryl Tinker, Editor of Kidzone, and writer Kelly Powell, won the bronze award for Best Profile Story – a story for young readers that profiled Australian Football League player, Anthony McDonald-Tipungwuti (Walla), who is originally from the Tiwi Islands. “[In this article] sufficient biographical detail is given but the emphasis on family relationship, education and faith, with strong quotes to back up the commentary, make this an article that will impact young readers positively,” read the citation. The Salvation Army was also given a highly commended award for its online media campaign, @SalvosChurchLife. The War Cry from the New Zealand, Fiji, Tonga and Samoa Territory also won several awards. Major Shar Davis, Assistant Territorial Communications Secretary and Book Production Manager for The Salvation Army, won the silver award for Best New Writer. Her story, “Raising Hope” focused on the joy of birth after two devastating miscarriages. The War Cry also won the gold award for Best Cover Magazine. Lauren Millington designed the cover, with Ingrid collecting the award on Lauren’s behalf. The Salvation Army is a member of the Australasian Religious Press Association.